Media representatives are facing increasing scrutiny from police and other public authorities. Thanks to the 24/7 status inquiry option offered by USPA, police officers may verify my membership status online at any time. I now have no problems getting information. There´s no way this would be possible without my press pass. I can finally carry out my work as a reporter and have access to current events. I´ve been a member of USPA for 4 years and am very content with the service. Being a photographer, I particularly appreciate the internationally recognized press pass issued by the United States Press Agency, along with the option to receive a letter confirming assignment. I´ve been blogging for many years and have gained a lot of journalistic experience in the process. Readers enjoy my articles and are interested in what I write. Unfortunately, I had been denied access to trade shows, music events or other interesting events in the past. Since becoming a member of USPA, the tide has turned. I´m finally treated with respect and enjoy free access wherever I want. My readers are thrilled about my growing range of topics. I´m now also earning additional income by marketing my articles through the associated agency GNA. I especially love the press sign for my car - I can even park in the front row - now that´sawesome! Whenever I visit events now, I simply present my press pass and march right in. Rarely, organizers get nit-picky and want to know for whom I´m writing. In those cases, words don´t cut it - but luckily, I have my letter of confirmation from the editorial office and the corresponding GNA Reporter Card. A great service, thanks a lot! I am working all over the United States, covering events such as Fashion Week, the NAMM Show, CES Las Vegas, the Miami International Boat Show, CHICAGO AUTO SHOW, and many others. Without the combination of my press pass and a letter confirming assignment, I would never have gained access to these events. I´ve been successful in selling my photos. I´ve been a reporter with USPA for about 1 ½ years. My experiences with the press credentials issued by USPA have been very positive. As a sports photographer, I can now take photos and interview people at important sporting events such as football championship games, various NASCAR events, and of course the annual Super Bowl. I´ve already recommended this agency to my colleagues. I´ve been in the possession of a USPA press pass for about 3 years now, and I always carry it with me. It´s been very helpful for my work. This press pass has allowed me to gain access and take photographs at many military installations in the USA, Germany and France, which would have been impossible without it. Hi, my name is Greg Fisher. I´ve been a member of USPA since 2007. I´ve only made great experiences with USPA. They´re professionals on every level. Let me tell you how satisfied I´ve been with my USPA press pass. I´m a sports photographer, and it has allowed me to attend important sporting events such as the 2012 Olympics in London and other international competitions. Once again, thanks a million! Not all press passes are cut from the same cloth. Unfortunately, I just found that out. 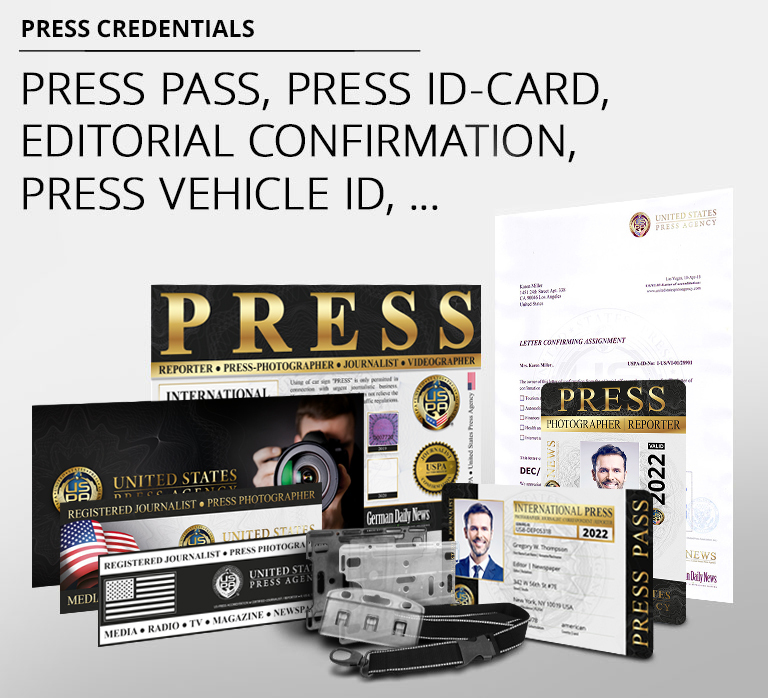 The United States Press Agency press pass is the third press ID I´ve held. Just like many other journalists in the USA, I realized that without the "right" press pass, you´re in serious trouble. I found my first two press passes on the Internet and bought one from XXXXXXX.org. It wasn´t until later that I found out that these organizations have only one business goal: to sell press passes. OK, it was cheap. As far as quality was concerned - well, no comment. When I presented it at events and trade fairs, it was utterly useless. In some cases, I was even laughed at. All that changed right away with my USPA press pass. My advice: Stay away from organizations that merely sell press passes! The whole package works - a press pass from USPA and publishing my pictures and articles on GNA. United States Press Agency is a legitimate alternative for people who work as part-time journalists. I highly recommend this agency. Let´s be honest - many people think all they need to do is buy a press pass and they´ll get access to every event. That´s just naive! Sure, a press pass is required at pretty much all big events. Then comes the second most important question: For which news outlet do you work? All journalists are familiar with the 5 W´s. So why not apply those questions in your search for a press pass? Media professionals need a press pass to carry out their work, but a web search for the word "press pass" frequently leads to results from less than reputable providers. How can you tell if an association or agency is legitimate? Legal notice - where is the company registered? Registration number? Is it a registered trademark? Capital stock as security? Names of responsible parties? How long has the company been around? What are the general terms and conditions? What is your impression of the website? How many menu items are there? Does the registration process include the question whether you work as a journalist? Is there a members-only area? If there is a news feed on the website - is it their own? Is there an option for a 24/7 status inquiry? Quality of press credentials and the press pass? Laminated document? Have all questions been answered? These are requirements for forming an informed opinion. I´ve been blogging for many years and have gained a lot of journalistic experience in the process. Readers enjoy my articles and are interested in what I write. Unfortunately, I had been denied access to trade shows, music events or other interesting events in the past. Since becoming a member of USPA, the tide has turned. I´m finally treated with respect and enjoy free access wherever I want. I especially love the press vehicle ID - I can even park in the front row! Whenever I visit events now, I simply present my press pass and march right in. If organizers ask about the agency I work for, I show my letter confirming assignment and the corresponding USPA News Reporter Card. It couldn´t be easier.